OC and Rupert didn’t want to change the world; they just wanted to spend an evening singing with some friends. But what began on a lark as a quaint hobby became a music revivalist tradition, evolved into a legitimate musical art form, and is now a dynamic force for changing lives throughout the world. "In this age of dictators and government control of everything, about the only privilege guaranteed by the Bill of Rights not in some way supervised or directed is the art of barbershop quartet singing. Without a doubt, we still have the right of peaceable assembly, which, we are advised by competent legal authority, includes quartet singing. "The writers have, for a long time, thought that something should be done to encourage the enjoyment of this last remaining vestige of human liberty. Therefore, we have decided to hold a songfest on the roof garden of the Tulsa Club on Monday, April 11, 1938, at 6:30 p.m."
Twenty-six men attended that first rooftop meeting, and their numbers swelled rapidly in subsequent meetings. At the third gathering, more than 150 harmonizers raised such a sound that traffic stopped on the street below. A reporter for the Tulsa Daily World chanced to pass by the scene, sensed a good story, and put the story on the national news wires. The lengthy original name and initials (SPEBSQSA)—founder Cash's way of poking fun at the New Deal's "alphabet soup" of initialed government agencies—captured the imagination of readers coast to coast, and inquiries came pouring in. Membership grew to more than 2,000 men in that first year, and the Society held its first convention and national contest the following year. 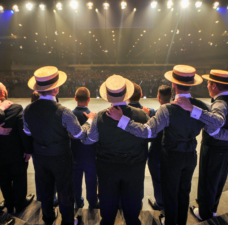 A maturing sense of purpose and mission in the new millennium led to a comprehensive strategic study, culminating in key insights that the Barbershop Harmony Society is uniquely positioned to make a difference in the world, thanks to its deeply committed members, unique culture, and passion for sharing music with others. Everyone in Harmony, the Strategic Vision adopted in 2017, calls for the Society to be radically inclusive. Everyone means EVERYONE -- men and women, young and old, of every background, every race, every sexual orientation, every political opinion or spiritual belief. 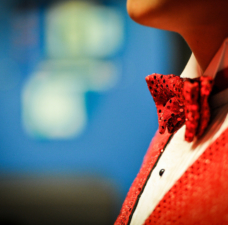 Every person who loves to harmonize has a place in the barbershop family. Membership was extended to admit women in June 2018, and an expanded range of membership experiences, ensembles and chapter offerings are currently developing. Barbershop continues to evolve, with ensembles of mixed voices gaining interest, alongside all-men and all-women’s groups. 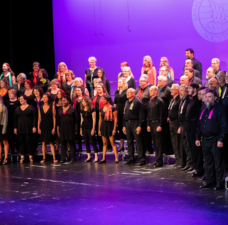 Reaching everyone means making sure the love of singing is supported from early years, which is why the Society has for decades partnered with music education organizations to support choral music educators in the classroom, and by way of scholarships to Harmony University. A vibrant Next Generation Barbershop program reaches hundreds of thousands of students each year through clinics and festivals. 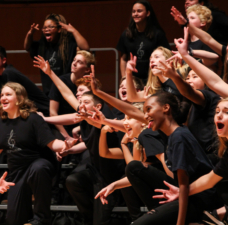 Harmony Foundation International, the Society's official charity, funds more than $1 million annually in programming at all levels that support community singing and music education. 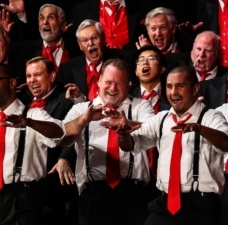 Barbershoppers actively support community service projects and local charities, and contribute many man-hours singing for churches, schools, and hospitals. In addition, most of the organization's chapters stage at least one annual show, bringing featured quartets and choruses to the community.